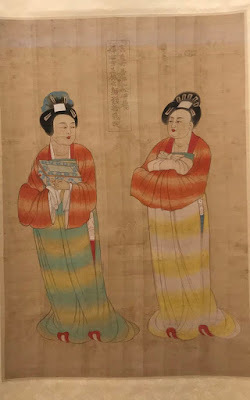 After work I went to the gym -- which some middle-aged women members there say is like "going to work". 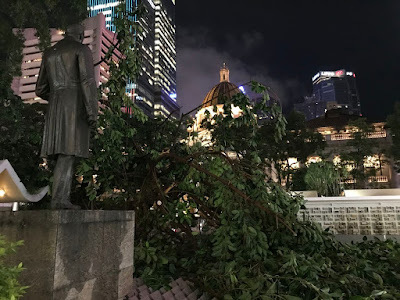 On my way to the Central MTR station, I passed by Statue Square and saw it was cordoned off because a giant tree had fallen down right in front of the statue of Sir Thomas Jackson, who was the chief manager of the Hongkong and Shanghai Banking Corporation now known as HSBC. Jackson seems to be surveying the damage, following Typhoon Pakhar. Luckily in Hong Kong we are relatively well prepared for typhoons and clean up is relatively fast afterwards. Guess that's where part of my tax dollars go. But there are reports in the Chinese media that there may be two more typhoons coming in the next week or so! Crazy weather this year!